BPSC 56th-59th Mains History-II Paper Exam Cancelled: BPSC History Re-exam to be held on 13 November 2016: To all those candidates who were having History as their optional paper, probably a bad news for them. 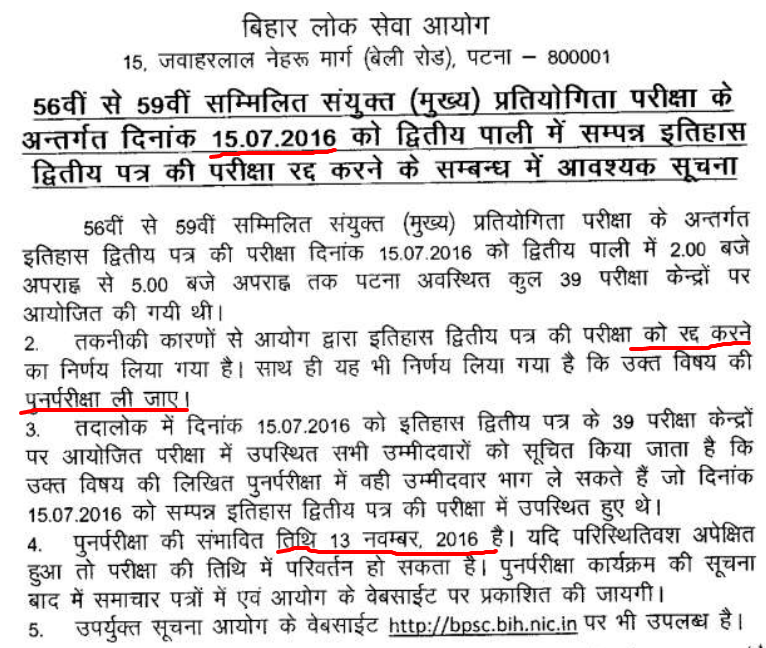 As BPSC 60th-62nd Notification announced on the other hand, the Bihar Public Service Commission (BPSC) has come up with another important notice regarding Cancellation of History-II Paper Exam held on 15-07-2016 under 56-59th Common Combined (Main) Competitive Exam. Written examination for BPSC 56-59 Mains Exam for History 2nd paper was held on 15th July 2016. Candidates appeared for History optional paper will have to appear for BPSC Mains Re-exam on 13th November 2016. According to BPSC, due to technical reasons it has been decided to cancel History II paper exam by Bihar Public Service Commission. It has been also decided to conduct Re-exam for History 2nd paper in due course. All those candidates who appeared for History 2nd paper on 15-07-2016 at 39 various exam centers are hereby notified that only those candidates can take part in re-exam. Candidates are hereby advised to start preparing for BPSC Mains exam History-II Paper again. BPSC Civil Services Recruitment 2016. 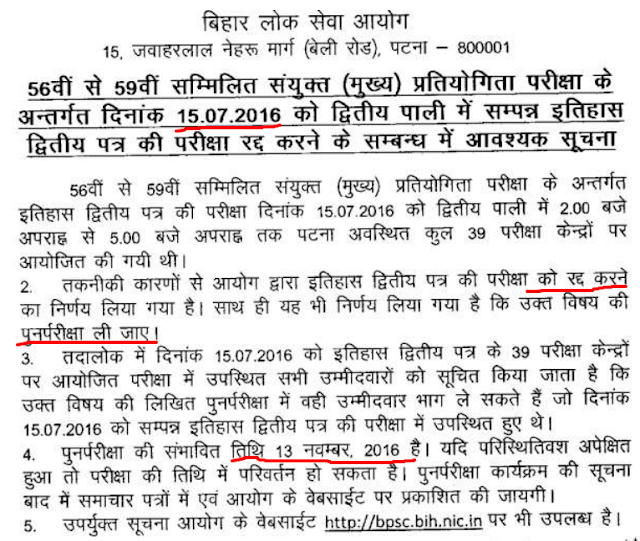 The Bihar Public Service Commission (BPSC) has announced tentative date for mains exam which has been scheduled to be held on 13 November 2016. Exam date might be changed.